Northern Nevada – Remote Area Medical (RAM), an organization dedicated to providing free, quality health care services, will host two FREE pop-up clinics for both adults and children in Northern Nevada. There are no eligibility requirements and no identification is necessary. Services are provided on a first come, first saved basis. The first pop-up clinic will be in Yerington October 9 through October 11, and the second will be in Carson City October 16 through October 18. RAM has the capacity to serve more than 600 people per day. Free services include dental cleanings, fillings, and extractions, eye exams and eye glasses, vaccinations for adults and children (including the zoster vaccination to prevent shingles in adults), mental health screenings and referrals, women’s care, general medical consultations, and referrals and connections to local follow-up care. There is no cost to patients and patients do not need to show identification or register for the events. However, guardians of minors must be present to give consent for services to minors. Patients are asked to bring a list of any medications they are currently taking. People should come prepared to stay on-site by bringing warm clothing, snacks and water if possible. Portable toilets will be available. October 9, 10, & 11 at the Boys and Girls Club in Yerington, 124 North Main Street. Numbers for clinic admission will begin at 3:00 a.m. each day and admission will be on a first come, first served basis. Patients will begin to be seen at 6 a.m. each day. All RAM clinics are first come, first served events. October 16, 17, & 18 at Carson High School at 1111 North Saliman Road, Carson City. Numbers for clinic admission will begin at 3:00 a.m. each day and admission will be on a first come, first served basis. Patients will begin to be seen at 6 a.m. each day. All RAM clinics are first come, first served events. QUESTIONS: For questions about the RAM event in Northern Nevada, please call (775) 350-4597. Volunteers, especially all types of dental and vision care professionals, are still needed. To volunteer, register online at www.ramusa.org by clicking on the “Volunteer” tab. 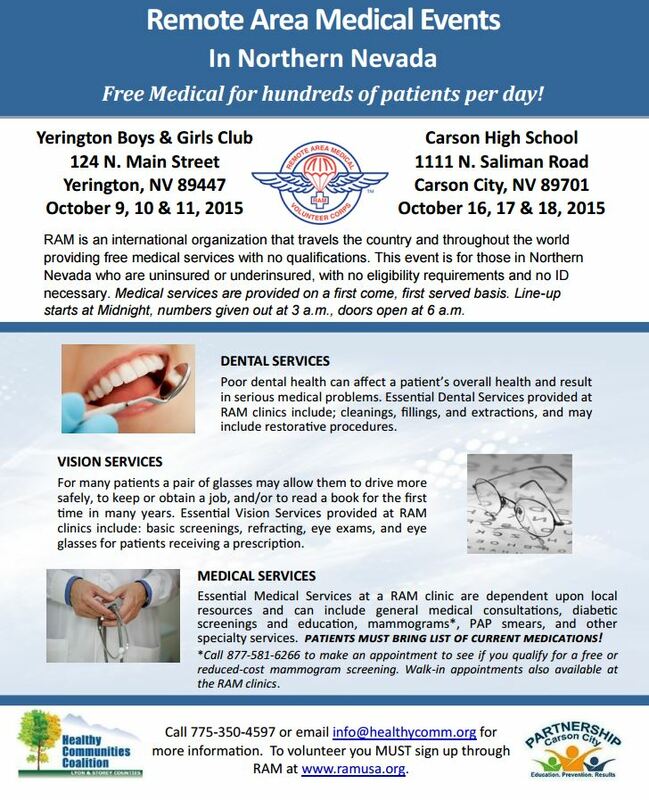 Remote Area Medical is coming to Yerington & Carson City! Donations are welcomed and are tax deductible. Donations to support the RAM events in Yerington and Carson can be sent to the nonprofit Healthy Communities Coalition, P.O. Box 517, Dayton, Nevada 89403. Please specify “RAM 2015” in the memo line of checks.